SAN DIEGO - More than 4,500 Sailors and Marines of the Boxer Amphibious Ready Group (ARG) and 13th Marine Expeditionary Unit (MEU) completed an eight-month deployment April 25 when the ships arrived at Naval Base San Diego. While deployed, the Boxer ARG/13th MEU served in the U.S. 5th, 6th and 7th Fleet Areas of Responsibility (AOR), providing maritime security operations, crisis response capability, theater security cooperation and forward naval presence. The Boxer ARG (BOXARG), led by Commander, Amphibious Squadron (PHIBRON) 1, is comprised of PHIBRON 1 staff, multipurpose amphibious assault ship USS Boxer (LHD 4), amphibious dock-landing ship USS Harpers Ferry (LSD 49), amphibious transport dock ship USS New Orleans (LPD 18) and Fleet Surgical Team 3. Additional detachments included Tactical Air Control Squadron 11, Helicopter Sea Combat Squadron 21, as well as Assault Craft Unit (ACU) 1 and 5, and Beachmaster Unit 1. "This team of well-trained professionals served the country honorably throughout the deployment. 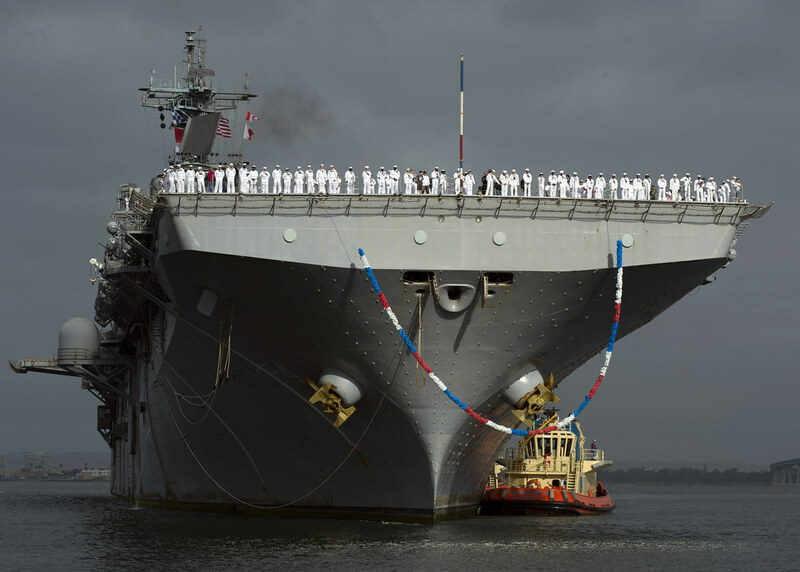 It has been an absolute pleasure leading these outstanding Sailors and Marines as they carried out numerous expeditionary operations in support of our nation," said Commander, Amphibious Squadron 1, Capt. Malcolm Potts. The 13th MEU is comprised of Battalion Landing Team, 1st Battalion, 4th Marine Regiment Aviation Combat Element, Marine Medium Tiltrotor Squadron 166 (Reinforced) and Logistics Combat Element, Combat Logistics Battalion 13. "The Marines and Sailors performed magnificently during their endeavors in the Central Command, Horn of Africa and Pacific AORs," said Col. Christopher Taylor, commanding officer of the 13th MEU. Over the course of the 244-day deployment, BOXARG transited nearly 60,000 nautical miles, flew 2,108 sorties, and logged nearly 4,000 flight hours. Amphibious craft completed more than 6,000 passenger transfers and moved more than 3.5 million pounds of equipment to and from the shore. This deployment also marked the first West Coast ARG to bring a compliment of MV-22 Ospreys and the first time UH-1 Yankee and the AH-1 Viper helicopters deployed together with the MV-22. The three ships conducted multiple port visits, and in addition to tours and liberty activities, many visits offered direct interaction with host country nationals and their culture through community relations projects and ship tours. "I'm so grateful for getting to see the world while standing ready to protect and defend our nation. I have wonderful memories of the unique port visits, and helping people in need during community relations events," said Operations Specialist 2nd Class Bryan Sandoval. Sailors and Marines also got the opportunity to interact with counterparts through military exchanges with British ships HMS Illustrious (R06) and HMS Bulwark (L15) as well as visit ITS Cavour (550), an Italian aircraft carrier. Additionally, BOXARG and the 13th MEU took part in numerous exercises to include Exercise Ssang Yong, an annual combined exercise conducted by the Navy and Marines with the Republic of Korea and Amphibious Landing Exercise 2013 (PHIBLEX), a bilateral exercise between U.S. and Philippine service members. "I'm incredibly proud of the combined Navy/Marine Corps team that operated together seamlessly, and I am forever grateful for the families at home who supported us with their selfless sacrifices," said Potts.